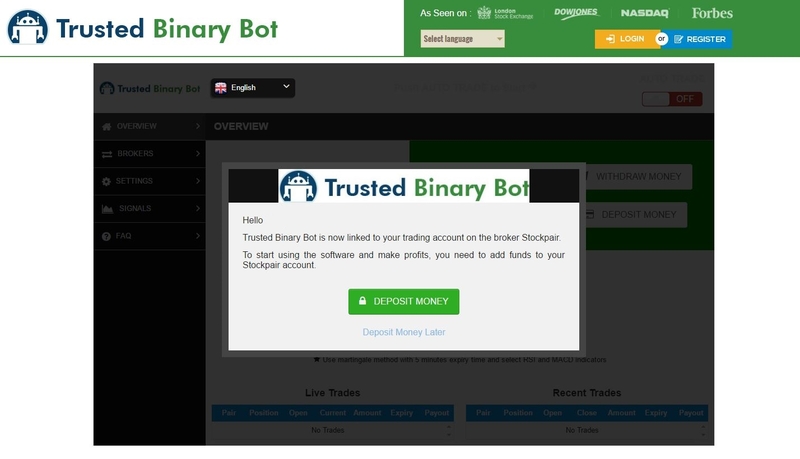 This review is a warning about a new binary options scam called „Trusted Binary Bot“. 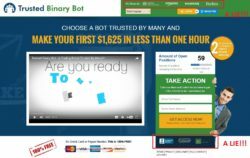 Trusted Binary Bot is supposed to be a revolutionary binary options trading software that can make you a lot of money. Trusted Binary Bot works an autopilot, so basically you have nothing to do or learn in order to become a millionaire. And it is of course free. We have already seen a lot of binary options robots that are based on a worthless piece of software that loses money. And Trusted Binary Bot is one of them. Look at the picture, it is based on the same crappy software as Option Robot. You see, scammers always say how unique and revolutionary their software is, but here you have a proof that Trusted Binary Bot is based on a white label useless app. This losing software is used by several scammers. It can even offer a demo, but the demo is fake and it manipulates results. This is probably why you won’t get a demo with Trusted Binary Bot, you have to deposit in order to be allowed to use the software. And this is another warning sign, never invest real money with any system if you could not try it on a free demo account first. Trusted Binary Bot is also full of lies, you could never see it on the London Stock Exchange, Nasdaq or other exchanges. And it is certainly not a BBB acredited business, nor is the site secured. And there is also this fake counter of remaining available positions, just reload the page and the number will sometimes go up, sometimes down. And don’t forget that 116 % (!) of traders who use it… Look at the second image. The point is that Trusted Binary Bot is not free. You will have to deposit money in order to use it and this robot will then lose your money. But by then scammers will have earned their affiliate commission from their broker, so they don’t care. 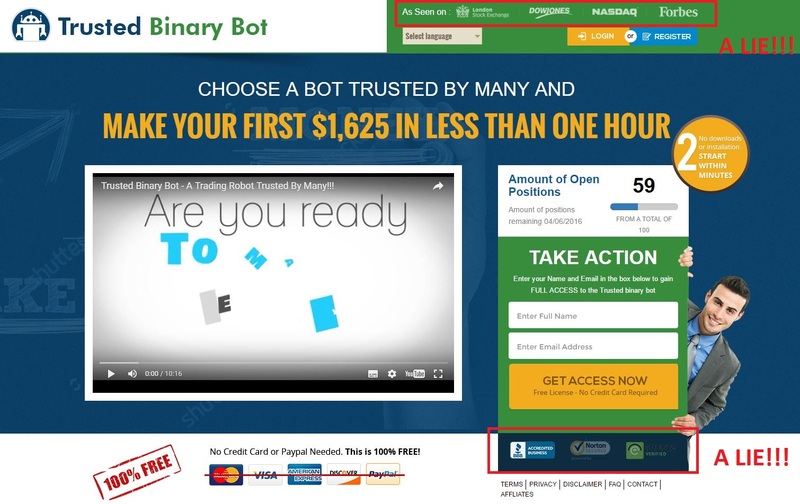 Trusted Binary Bot is a very simple scam based on a white label losing binary options robot. So don’t invest with it.